Marjorie Bowen is one of several pen-names that were adopted by the writer Margaret Gabrielle Vere Campbell Long (1885 – 1952). The Bishop of Hell & Other Stories is 189 pages long and contains a dozen tales of the supernatural and macabre. The book’s introduction is written by her son, Hillary Long. The first story, “The Fair Hair of Ambrosine” is set in Paris, where the central character Claude Boucher is counting down the days to the 12th of December with an increasing dread. Claude works as a clerk in The Chamber of Deputies and has been entrusted with the delivery of some important documents on that date. This is a task that he had originally looked forward to because it gave him a sense of importance. But then Claude’s memories took him to the little house on the banks of the river, where his former love, Ambrosine, used to live. It is also where she died, or to be more precise, it’s where she was murdered. Claude will have to walk right past the house to deliver the documents and just the thought of doing so makes Claude feel uncomfortable. Then he begins to have bad dreams, in which Ambrosine’s killer accompanies him on his journey. The central character in “The Crown Derby Plate” is an elderly lady named Martha Pym. Although Martha has never seen a ghost she would very much like to do so, and this is the subject of conversation between Martha and her two friends when the reader first joins them as they sit talking beside the fire. It’s Christmas though, and ghost stories and Christmas go together like holly and ivy, or sage and onion. It is easy to talk of such matters when sitting in good company, but it is quite a different matter when you are alone, in dismal countryside, or a big, old house, miles away from the town, and where there is a distinctly odd smell and your company is odder still. It’s in a house such as this that Martha soon finds herself when she goes looking for the missing Crown Derby plate that she needs to complete her set. “The Housekeeper” is the story of a rather unpleasant gentleman named Robert Skeforde, who married his second wife for her money. Robert was fooled though. The second Mrs. Skeforde misled him. She has no money at all. In fact, she only married him because she believed that he was the wealthy one. They are both nasty characters who deserve each other and they are not, as you might have guessed, happy in their marriage and one of the worst things for Robert is that his present wife is such a poor housekeeper. His first wife was different, she was a very good housekeeper indeed and it appears she’s returned from beyond the grave to put her house in order. “Florence Flannery” is the tale of a young lady who gets married and goes to live at her husband’s house in the country. As in the previous story the young lady has been slightly mislead about her husband’s wealth and the ‘fine manor’ has seen better days. Florence becomes intrigued when she discovers her name scratched onto one of the tiny panes of one of the leaded windows: ‘Florence Flannery Borne 1500.’ Florence, who is quite amused by this, uses the diamond in her ring to scratch the present year into the glass: ‘1800.’ Although this was not her intention, the new mark looks odd and, as her husband remarks, it is almost as if it represents Florence’s year of death and all to soon the idea seems set to become reality. “Elsie’s Lonely Afternoon” might better have been called Elsie’s Lonely Life because Elsie, who is just seven, has had many lonely afternoons and any number of lonely mornings and nights as well. Elsie lives in a big house at Hampstead with her ailing grandmother who forbids her to speak to the servants—to be honest, they don’t sound too nice a bunch anyway. Elsie’s grandmother is confined to bed so Elsie, whose parents are dead, has never had much company and her diet is simple, even though her grandmother is very rich and the pantry is filled with many good things to eat. It is a sad life for a little girl and this is a tragic story that paints a picture in the many colours of neglect. There is also—it would seem—a ghost in this story and it’s a sad day indeed when Elsie and the ghost meet face to face, though poor little Elsie is blissfully unaware of the further blow that fate has just dealt her and is too busy worrying that someone will find out she has borrowed the keys to a locked cupboard and stolen some jam. The reader learns that Hector’s excess, impiety and boldness terrified even those who were hardened in their own wicked ways. His father had at one point placed Hector in the church, but the young man’s wickedness soon saw him unfrocked, causing his friends from the clubs and gambling dens to give him the nickname the Bishop of Hell. No respectable person wanted to know Greatrix, the only notable exception being his cousin, Colonel Buckley, who often helped Hector by ‘his countenance and money.’ The strangest thing about this is that the colonel is an upright and decent man with a distinguished military career. The colonel is also very happily married. He is a family man who loves his wife and child. His wife is equally loving in return and the Buckleys appear to be the ideal family unit until Hector steps in, elopes with his benefactor’s wife, and turns her into a whore so that he can live off the income generated. Nice guy that Hector, but don’t worry, he gets what is coming to him even if a lot of innocent people do get hurt along the way. “The Grey Chamber” was written by an anonymous author, but the story is included in this collection because Bowen translated it from the original French text. The story is only a few pages long and to be honest it is very similar to a lot of other stories in its basic set up: a man goes to stay with a friend and is given a haunted room for the night. This is quite a creepy story, and very reminiscent of Sir Walter Scott’s “The Tapestried Chamber“. Personally though, when it comes to stories like this, I much prefer H.G. Well’s “The Red Room”, but this is probably a lot older than the other two stories and—who knows?—it may even have been the inspiration for them. The chamber in this story is haunted by the ghost of a fair young maiden, who killed herself in the room after being raped within its walls. This terrible situation was made even worse when she was no longer considered pure enough to pursue her ambition of becoming a nun. In “The Extraordinary Adventure of Mr John Proudie”, a chemist receives a late night visitor. The man at the door has his face hidden behind a mask and, speaking with an Italian accent, he demands the services of the doctor who rents the room above Mr. Proudie’s shop. Mr. Proudie is no more happy about disturbing his lodger than he is about being disturbed himself, but the masked man is most insistent and the doctor, who spent some time living in Italy, seems happy to go; but later has second thoughts. Then the stranger shows him a curious-looking white enamel ring and the sight of this object is enough to convince the doctor to step out into the night. When the doctor does not return, Mr. Proudie begins to worry. Then he has a second visitor, a young lady this time. She too has an Italian accent and Mr Proudie is soon following her out of the shop and going in search of his lodger. “The Scoured Silk” is a particularly nasty story, but you will have to read it yourself if you want to know how nasty because I do not want to give away too much of the plot. The two main characters are Mr Orford and the young lady he is engaged to marry, Elisa Minden. Mr Orford is a scholar whose life’s work seems to be the process of translating Ariosto’s romance into English couplets and writing essays on recondite subjects connected with grammar and language—doesn’t he sound an interesting guy? Orford is middle-aged and considerably older than his fiancee. He has also been married before. In fact, twenty years ago, when his first wife came to live with him at the house in Covent Garden, Elisa Minden was just a small child watching from the railings around her home. Nobody saw much of Flora Oxford after that and it was not long before she died. But that was twenty years ago and now the child is a lovely young woman. Though it must be said that it was Elisa’s father who arranged the marriage and not Elisa herself. When Mr Orford takes her to see Flora Orford’s place of interment and tells her what a wicked woman she was, displaying a certain amount of delight about her death, Elisa begins to have second thoughts and who can blame her? Bowen’s story “The Avenging of Ann Leete” centres on a painting of a young lady in a green silk dress. The story is set in 1845 and the narrator is telling the reader about how he became fascinated by the picture that was, at that time, already seventy years old and how, against all odds and quite by chance, he was fortunate enough to meet someone who knew Ann Leete. What became of her is the real story. In “Keksies” two young men, Crediton and Bateup, both worse for drink, are caught out in the open countryside when the weather takes a turn for the worse. One of the men owns a nearby farm and the duo feel they have every right to barge into the farmhouse and make themselves at home. This story is set in the days when horsepower and saddles were the only way to go, but a modern word best describes the two men: wasters. As it happens they are not the only guest at the farmhouse. Another guest lies stretched out on the table in the next room and his drinking days are over. Some of the man’s friends are also expected at the farm and many of them will want to pay their last respects. Crediton and Bateup have little in the way of respect though, and when circumstances leave them alone with the body they decide to have a little fun. However, the last laugh is on them. The Final story in the collection is called “Ann Mellor’s Lover”. It’s about a man who runs a bookshop and, through his love of books, has managed to develop clairvoyant abilities. His main skill seems to lie in the practice of psychometry and he often receives glimpses of the past just by touching things. This story is about what happens when he finds an old sketch of a young woman. It is trapped between the pages of a book and he feels an immediate affinity to the picture and also knows, from past experience, that little by little he will receive the insights he needs to get the full picture of the girl’s identity. It’s not long before he discovers her name was Ann Mellor and it appears that they were acquainted in a past life. 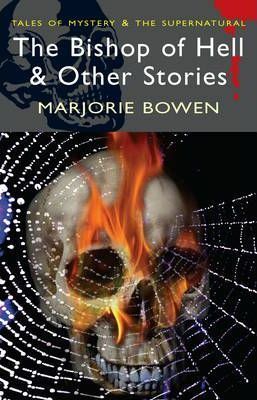 All of the stories in this collection share a supernatural theme, but the real horror in the stories comes from Bowen’s depiction of the darker side of human nature. Men like Hector Greatrix in “The Bishop of Hell”, for instance, who live their lives without any morals or conscience about what they are doing or who they hurt. Or the using and abusing Skefordes from “The Housekeeper”, who may not have been a match made in heaven, but were, in many ways, a perfect match because they were so alike. In “The Crown Derby Plate”, Martha Pym is motivated by greed to visit a spooky house in the middle of nowhere. That Crown Derby plate is the final piece required to complete her set, and, when she has got it, she does not think twice about turning her back on what she perceives to be a lonely old woman. Martha is not a bad person and certainly not evil, but neither is she a saint and her greed is very apparent. If you read “The Scoured Silk” I am sure you will find Mr Oxford nothing short of a monster. He’s a well-spoken and well-presented monster, but those are often the worse kind of all. My favourite story in The Bishop of Hell has got to be “Elsie’s Lonely Afternoon”, Greed rears its ugly head in this story too, and it is a very sad tale, but it’s the sort of story that sticks with you long after you have closed the book. The Bishop of Hell & other Stories would make a good addition to any bookshelf. Some of the stories like “The Fair Hair of Ambrosine” and “The Crown Derby Plate” have predictable outcomes, but are nonetheless very enjoyable, not just for the plot, but also for the strength of the writing. The dialogue is believable and Bowen’s descriptive talent was second to none.